Author and Tucson native, Tom Zoellner, will give a lecture titled "Uranium Since the Middle Ages and the Atomic Legacy of the West" at 8:00 PM on Tuesday, September 1 at the Sheraton Four Points Hotel on the southeast corner of Campbell and Speedway. This lecture is based on his recent book Uranium, War, Energy and the Rock that Reshaped the World, published by Viking Penguin. Antigone Books on 4th St. has arranged for a book signing before and after the lecture. He will also be signing copies of "The Heartless Stone: a Journey through the world of diamonds, deceit and desire." Mr. Zoellner has discussed his books on numerous national TV shows, including The Daily Show. The lecture will be part of a dinner meeting of the Arizona Geological Society. There is no cost to attend the talk, but if you wish to join the Society for dinner, reservations must be made at (520) 663-5295 before August 28. The cost for dinner for non-members is $27. Mr. Zoellner will be signing books from 6 to 7 PM and after 9 PM. Tom Zoellner has written a stunning book about he calls the "apocalyptic pull of uranium." His reportage reads like a detective story with a cast of characters ranging from H.G. Wells to Robert Oppenheimer to A. Q. Khan. His writing is at once lyrical, historically informative and deeply investigative. Zoellner's engrossing history of uranium is a formidable achievement." 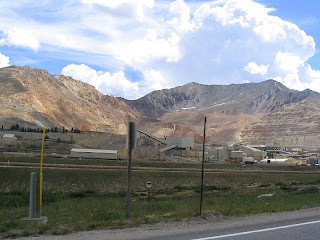 Phoenix-based Freeport McMoRan Copper & Gold's plans are still on hold for reopening their Climax molybdenum mine in Colorado [right. Credit Ken Lund, Creative Commons]. Fred Menzer, the company's VP for Colorado operations told a meeting of the Summit County Rotary Club that Freeport has spent $200 million since announcing plans two years ago to re-open the mine, but another $350 million is needed to bring that to fruitionm, as reported in the Summit Daily News. 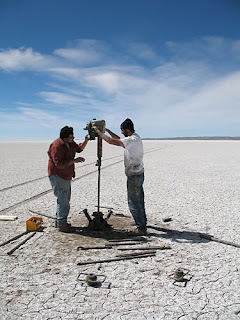 The Climax Mine is regarded as one of the premier moly deposits in the world but the price drop of last year from $30 to $8 per pound brought progress to a halt, although moly prices are now in the $8 - 14 per pound range. 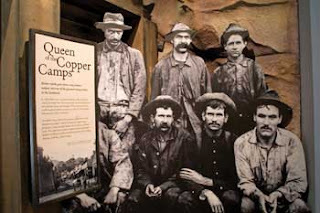 The Bisbee Mining & Historical Museum's new permanent exhibit, “Digging In: Bisbee’s Mineral Heritage,” received the Governor’s Award for Arizona Preservation from the Arizona Office of Tourism and the Award of Merit for Leadership in History from the American Association of State & Local History, according to the Sierra Vista Herald. The new exhibit was created by the Smithsonian Institution. Bisbee and Sierra Vista residents get free admission during August. Psst, wanna buy Kartchner Caverns? Bob Casavant, a geologist and chief science advisor in State Parks, was in Texas last week, meeting with world cave experts. 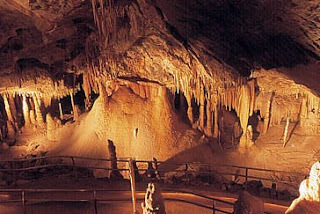 He reports that Kartchner is considered the world leader in management of a living cave system. Where are all the economic geologists? 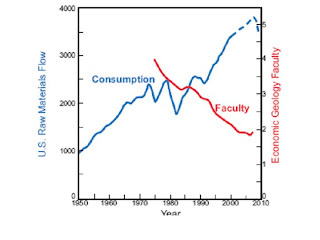 An important article in the new issue of GSA Today asks the critical question, "Could we be facing the collapse of the science that underpins the long-term supply and stewardship of the mineral resources on which our nation depends?" The answer, from authors Murray Hitzman, John Dilles, Mark Barton (Univ. Arizona), and Maeve Boland, is a pretty compelling, 'yes' with concerns that we are facing an impending national crisis. mining industry, and the U.S. academic community regarding the importance of economic geology to future U.S. competitiveness," and call for a national dialogue among all the parties to develop a new strategy. UFO reports from Sedona aren't as rare as you might expect. But this spinning object is certainly different than others I've seen photographed. It looks like some kind of computer icon that spins while you wait for something to download. 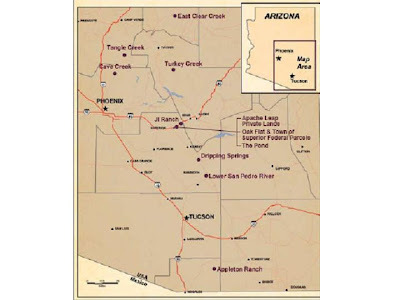 The BLM is starting the EIS process for a solar power center near Buckeye, west of Phoenix. The 375-megawatt facility will cover 4,000 acres with collectors within a 14,000 acre block. This is one of the first, if not the first full review of a major solar energy plant on public lands and I have to wonder how it will fare. The block of land abuts the Sonoran Desert Monument to the south and other protected lands lie just west. Will opposition surface to an industrial power plant covering 6 square miles? Will the promise of non-fossil fuel renewable energy quell any concerns about land and water use in the area? The number of solar plant applications and amount of land proposed across Arizona and the West are impressive. BLM has recognized the potential for conflicts over millions of acres proposed for development. This process deserves to be watched closely as a harbinger of how large-scale renewable energy projects will fare. Augusta Resources announced that they entered into an underwriting agreement for the issuance of 12,380,000 common shares at a price of Cdn$2.02 per common share for gross proceeds of Cdn$25,007,600. 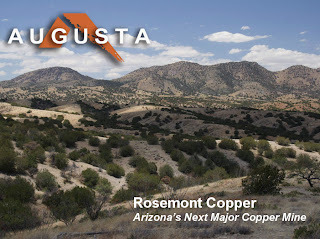 The funds will be used in developing the Rosemont Copper mine in the Santa Rita Mountains, south of Tucson. The US Forest Service is conducting an EIS for use of federal lands adjacent to the mine. 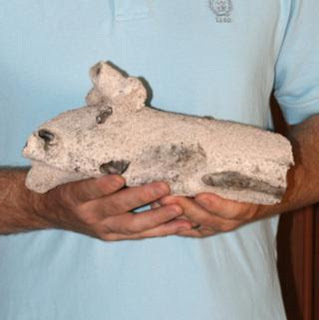 Arizona geologist Allan West has been forwarding a theory for the past four years that a giant comet struck Canada 12,900 years ago, wiping out many Ice Age megafauna and ushering in a 1,000 year global cooling period. There are lots of skeptics. 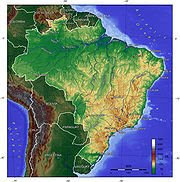 However, a new study, co-authored by West, came out in Proceedings of the National Academy of Sciences last week, with evidence of microscopic ("nano") diamonds on Santa Rosa Island off the coast of California, that the authors call a smoking gun proving the idea that a massive impact, possibly into the Hudson Bay region, covered the continent with a cloud of super-hot ejecta. 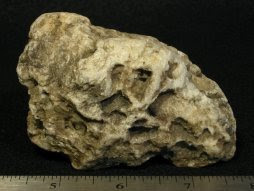 The authors state that this form of nanodiamond, lonsdaleite, "is known on Earth only in meteorites and impact craters, and its presence strongly supports a cosmic impact event." They note that "These shock-synthesized diamonds are also associated with proxies indicating major biomass burning (charcoal, carbon spherules, and soot). The only previously known co-occurrence of nanodiamonds, soot, and extinction is the Cretaceous-Tertiary (K/T) impact layer" which is blamed for the end of the dinosaurs. 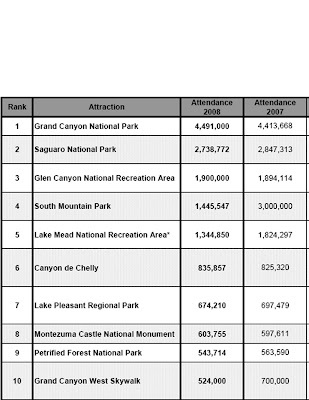 The Grand Canyon is once again the top natural attraction for tourists in Arizona according to statistics released today by the Arizona Office of Tourism for 2008. 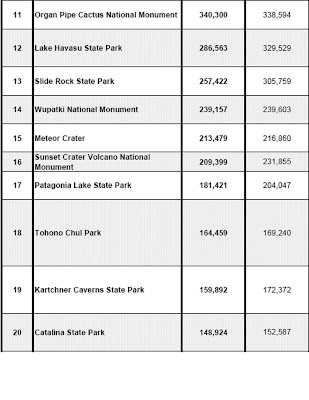 A number of other geological wonders show up in the list of the top 20 natural sites most visited. Attendance was almost 4.5 million last year. Could CCS double costs of electricity? He told me, "It just might sober a lot of folks up to the realities of the morning after." The seven coal ash ponds at the Willcox area's Apache Generating Station [right, Google Earth], operated by Arizona Electric Power Cooperative, are on the list of 44 "high hazard potential" waste sites from coal-fired power plants released by EPA earlier this month. But in an interview with the Benson News-Sun, company officials noted that EPA itself says "A high hazard potential rating is not related to the stability of those impoundments, but to the potential for harm should the impoundment fail." AEPCO said the facilities are inspected daily, weekly, and monthly, as well as annually by the ADWR Dam Safety & Flood Mitigation division. EPA is carrying out safety reviews of all the ponds nationwide, with the results to be made public when completed, probably around the end of the year. 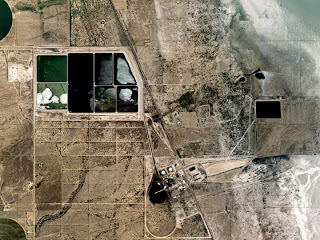 Arizona has a second coal ash pond facility at near Joseph City in the northeast part of the state. The Arizona Dept. 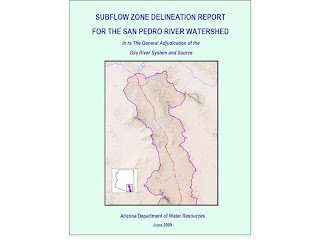 of Water Resources has released a 1,300 page report on subflow zones along the San Pedro River as part of a legal adjudication of water rights. Subflow is that part of the river that flows in the subsurface. Delineation of the subflow will determine who has rights to groundwater. The court defined subflow as occurring in the Holocene floodplain alluvium. The AZGS did the geologic mapping of Holocene-aged units along the river and tributary valleys for the ADWR study. Those 1:24,000-scale maps will probably be released publicly next week. The Camp Verde Bugle did as nice review as I've read of the issues on the San Pedro as a possible prelude to simlar adjudication battles on the Verde River. 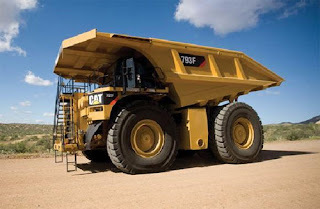 Augusta Resources announced last week the signing of an agreement for the purchase of 23, 250-ton Caterpillar 793F haulage trucks [right, credit Caterpillar Corp] for the Rosemont Copper mine at a cost of $82.2 million from Empire Southwest, a Caterpillar dealership headquartered in Mesa, Arizona. The trucks are due to be delivered in late 2010 and early 2011. The Rosemont mine is undergoing an EIS by the US Forest Service, expected to be completed in 2010.
they received from the Arizona State Land Department the approval of five mineral exploration permits totaling 3,200 acres and the request for plan of operations for eight additional mineral exploration permits totaling 3,222.93 acres. These, together with the pending Bureau of Land Management ("BLM") potassium prospecting permits total 9,690 acres of land available to American Potash for drill testing in Arizona. Relative to the BLM potassium prospecting permits, American Potash has received a letter of request from the BLM for exploration program proposals, the precursor to final permit approval. Mark Trees, one of the 3 students who returned from Brazil yesterday, shared this thank-you to everyone who spoke out and otherwise supported their efforts to leave the country after being arrested for sediment sampling without the required permits. for a quick decision in our favor and to get this ordeal behind us for good. National Geographic: Is Phoenix in danger of "Collapse"? 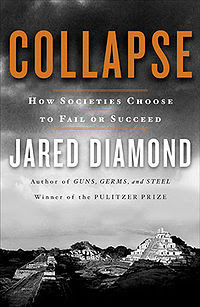 A National Geographic film crew is working in the Phoenix area on a documentary based on Jared Diamond's best-selling book, "Collapse." The book examines the factors that led to the collapse of cities and civilizations through history. AZGS geologist Todd Shipman took the crew to film Earth fissures in the greater Phoenix basin last week as indicators of basin subsidence resulting from overpumping of groundwater. Diamond lists water management as one of 8 factors that historically led to collapse of societies. I am writing to update you on the situation about the US and Brazilian students arrested while doing field work in the Pantanal region of Brazil. Early this past week a ruling was made in the Brazilian Federal court allowing the American students to get their passports back and last night they all left Brazil to return home. The issue is not completely resolved since by Brazilian law they may yet have to return to Brazil to answer questions, although a legal request was also made to the court to allow them to answer questions from their homes in the US. Formal charges have not yet been filed by the police to the court, and we remain hopeful that eventually the original charges will be dropped, but will have to wait for this for the time being. In the meantime I am extremely grateful for the outpouring of support from all of you in your signing the petition for the students and your many letters of concern. The response to the petition was overwhelming-I had received over 400 signatures by the time I had to submit the petition to the court and the petition received attention in the largest circulation daily newspaper in Brazil. That document was attached to various other support letters and affidavits to the court and I am certain it will prove helpful in convincing the court of the nature of the student's activities and their acting in good faith regarding necessary permits and visas at the time of their arrest. This week's Congressional hearing on uranium mining, called by committee chair Rep. Raul Grijalva of Tucson, may be indicative of the rising debate over uranium mining in northern Arizona. I get the sense that this is turning into one of the environmental flash points nationwide. A Nevada university professor is quoted as saying that he found high levels of uranium in a canyon creek which he claimed were the result of mining more than a decade ago. AZ Dept. of Mining and Mineral Resources director Dr. Madan Singh challenged that, saying the concentrations are from erosion of the naturally-occurring uranium-bearing deposits in the region. Tucson-based uranium geologist Dr. Karen Wenrich, argued that it's not appropriate to compare modern mining methods with out-of-date techniques used decades ago. It was a good day for copper yesterday. 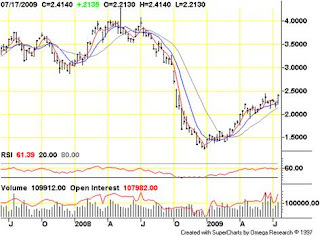 U.S. copper prices closed at $2.5255 for September contracts, a 9-month high, the first time they went over $2.5o since October, and double the price at the low back in December [right Bloomberg chart from Mineweb.com]. What's driving this at least in part, according to an analyst at Mineweb.com, are record imports by China for the fifth straight month. BHP Billiton however, says China has about refilled its inventory and major economies in the rest of the world are starting to refill theirs. Arizona produces about 60% of the U.S. demand for copper, so global production, demand, and prices are an important factor in the local economy and U.S. supply. "But if climate change results in a 10% reduction in the Colorado River's average stream flow as some recent studies predict, the chances of fully depleting reservoir storage will exceed 25% by 2057, according to the study. If climate change results in a 20% reduction, the chances of fully depleting reservoir storage will exceed 50% by 2057." 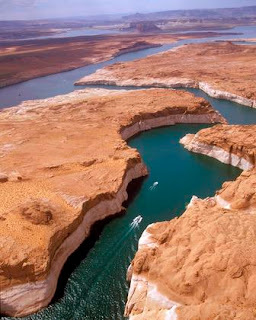 "Total storage capacity of reservoirs on the Colorado exceeds 60 million acre feet, almost 4 times the average annual flow on the river, and the two largest reservoirs -- Lake Mead and Lake Powell -- can store up to 50 million acre feet of water. As a result, the risk of full reservoir depletion will remain low through 2026, even with a 20 percent stream flow reduction induced by climate change." Ref: "Water Supply Risk on the Colorado River: Can Management Mitigate?" The Secretary of Agriculture is putting 360,000 acres of national forest lands near Grand Canyon National Park, off limits to new mining claims for the next two years, bringing the total amount of lands 'segregated' by federal agencies to 1 million acres according to news reports out this morning. 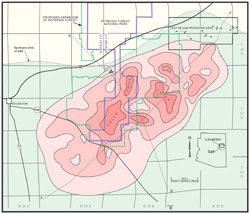 Existing mine claims are not affected by the decision. Interior Secretary Ken Salazar last week segregated the BLM lands. The Arizona chapter of the Sierra Club put out its annual Environmental Report Card on state legislators' votes on issues and also summarized the final action on a number of bills that dealt with natural resources. Not unexpectedly, most legislators got failing grades. Whether you agree or disagree with the Sierra Club's stance on some of the bills, they explain their position and give a brief history of what happened to the bills. Topics include tires in abandoned mines, aquifer protection, water resources, aggregate mine reclamation, greenhouse gases, land conservation funds and others. 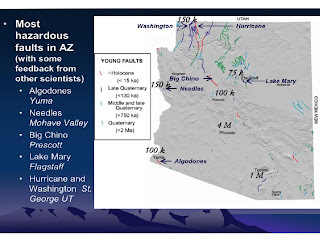 A new report out from the USGS on hazardous faults in the Intermountain West region includes a section on Arizona by AZGS hazards chief, Phil Pearthree. 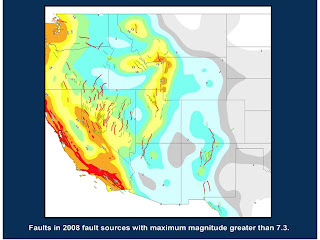 The overall picture of hazardous faults in Arizona has not changed significantly since the first basic studies were conducted about 25 years ago. 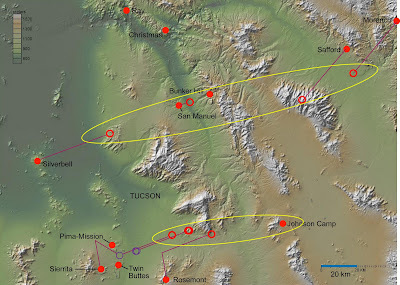 Most historical seismicity in Arizona is concentrated in the northern part of the state with a cluster of events in the Flagstaff area dating back to 1900. However, the 1887 earthquake, which occurred just across the southern border in northern Mexico, is the largest historical earthquake to affect Arizona and possibly the entire IMW. By Anthony J. Crone, Kathleen M. Haller, and Joseph Z. Maharrey, Open-File Report 2009–1140, 75p. Asarco is trying to sell its $6.4 billion court judgement from Southern Copper to more than 100 potential buyers according to a report on Mineweb.com. The court award Asarco 260 million shares of Southern Copper and $1.4 billion in cash this past spring. It sounds like Asarco would sell the pending award at a discount to get cash now to help pull it out of bankruptcy. Bids are due in early August. 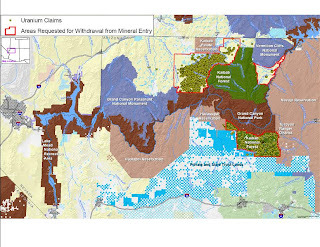 AP is reporting that Interior Secretary Ken Salazar will announce the closure of 1 million acres of federal lands to mining claims in northern Arizona because of their proximity to the boundaries of Grand Canyon National Park. The objective is to undertake a 2-year study on whether the areas should be permanently closed to mining. It does not affect existing claims. 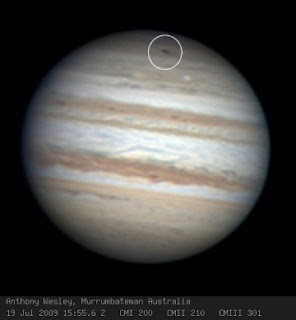 New comet impact on Jupiter? "Jupiter has been hit by something similar to the Shoemaker-Levy 9 impacts in 1994. There is a jet black circular impact mark near its south pole that I imaged tonight from my observatory in Murrumbateman, Australia. I have imagery of that same location from 2 nights earlier without the impact mark so this is a very recent event. This image shows that the material has already begun to spread out in a fan shape on one side, and should be rapidly pulled apart by the fast jetstream winds. I'm sure this will generate some interest around the astronomy community, as impacts like this are rare. I recorded a lot of footage, and will be generating more images and a rotation animation." SpaceWeather is calling on amateur astronomers around the world to monitor developments on Jupiter. What a nice way to celebrate the anniversary of the first moon landings. The Tucson Citizen newspaper has morphed into an online new media format, including a long list of volunteer bloggers. One I just found is "Wry Heat," written by "Jonathan DuHamel - Economic Geologist." This blog will deal with science, mainly geology and climate change; energy, the environment, natural history of the Sonoran Desert, property rights, and the politics and policies that effect these issues. There will occasionally be an off-subject story or two. 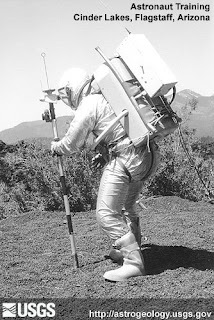 With the 40th anniversary of the first lunar landing underway this week, the Los Angeles Times does a nice retrospective on the astronaut field training program in the Cinder Hills (Lakes) near Flagstaff that began in the 1960s. Neil Armstrong and his crew traipsed across the 21-square mile crater field to familiarize themselves with the expected lunar terrain. Sterlite Industries' bid for Asarco has been endorsed by a committee of unsecured creditors of that company. Sterlite raised $1.5 billion in a single day this week, selling additional shares. Phoenix-based Freeport McMoRan Copper & Gold ordered its Indonesian employees to stay home after 3 people were killed and 9 wounded on the road to its Grasberg mine in Papua. A production crew for a tv new series that will air on the Discovery Channel starting in October is filming a show in Tombstone the next couple of days. One of the producers told us, "The show is about a group of paranormal investigators from San Antonio who use scientific methods in order to try and prove the existence of other dimensions." 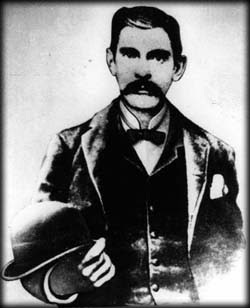 The show has been looking for a geologist to talk about mineral deposits in the Tombstone area reportedly as a tie in to electrical currents in the ground and the ghost of Doc Holliday [right. credit www.freeinfosociety.com] among other things. While we are more than willing to answer any questions on geology in Arizona, we demur from being associated with the pseudo-science movement. 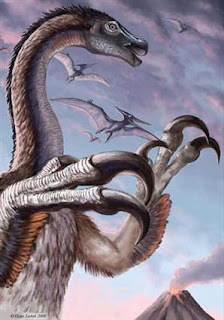 If you've been to the Museum of Northern Arizona in the past year, you've seen the spectacular therizinosaur exhibit put together by paleontologist David Gillette. The rest of the world is now starting to see what the excitement's about. The results of the discovery were published this week in Proceedings of the Royal Society B and the news media, always on the alert for good dinosaur discoveries, are playing it up. The exhibit Therizinosaur: Mystery of the Sickle-Claw Dinosaur, will run until this September then move to the Arizona Museum of Natural History in Mesa. Rosemont has made a commitment to the local community to recharge 105% of the total mine water production within the Tucson AMA basin, as close to the water production site as is feasible. The total life-of-mine usage is currently estimated to be 100,000 acre feet, resulting in a recharge commitment of 105,000 acre-ft. 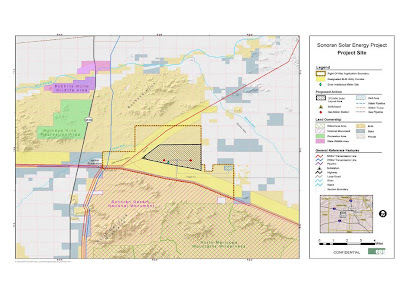 Meanwhile, the company announced today that they received written notification from the Arizona State Mine Inspector that the Rosemont Copper Project Mined Land Reclamation Plan has been approved. How much damage would a prehistoric piranha do? 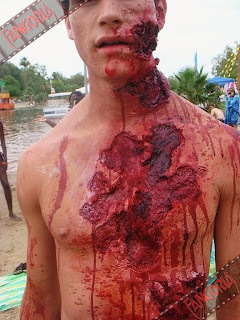 More photos from the "Piranha 3D" movie filming at Lake Havasu made it to the horror film blogosphere. The plot, as I've mentioned before, is about prehistoric piranha released from under the lake by an earthquake, on an unsuspecting spring break crowd. You can see just how hungry these guys are from the photo at right. Check out the fangoria.com site for even more gore. The director has explained more about the plot line, revealing that the prehistoric fish survived in a cavern under the lake for millions of years, evolving into more ferocious forms, and feeding off their brethren and other fish trapped there. Sounds like they could have used a geological consultant on the film, but a little scientific reality is probably not what they are looking for here. 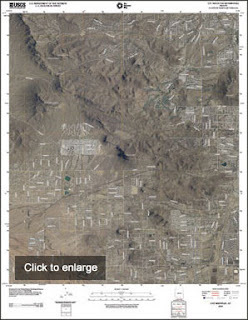 The USGS released the Digital Map last week, so I tried out one of the sample digital topo maps overlying orthophotos, for the Tucson area. The "Digital Map - Beta" is the first step toward a new generation of digital topographic maps delivered by the U.S. Geological Survey. These maps are built from The National Map data, which are integrated from local, State, Federal, and other sources. The initial version of the "Digital Map – Beta" includes orthoimagery plus roads and geographic names in the traditional 7.5 minute quadrangle format. "Digital Maps - Beta" are available free on the Web in the GeoPDF format. File size is about 15 to 20 Megabytes. Tools are available free for download. Users can turn data layers on and off, zoom in and out, and print the maps. As the "Digital Map - Beta" evolves, the USGS will add historical versions of the topographic maps and will incorporate other data layers including hydrography and contours. 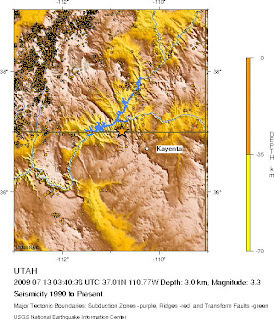 Use of the term "Beta" signifies that these maps are initial versions that do not yet contain the full content of the traditional USGS topographic quadrangle maps. The area has not had many recorded earthquakes previously but you can see regionally there are more active areas nearby. There's an interesting new study published in Nature Geoscience by UA geoscientist Matthew Pasek. 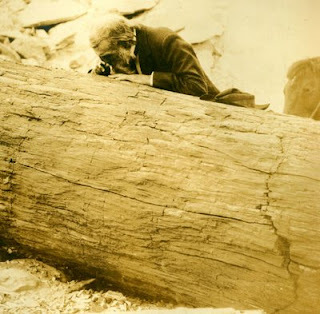 He found that fulgurites [right. Credit, Matthew Pasek] formed by the intense heat of lightning strikes, contain unusually large amounts of phosphite, a form of phosphorus that is low in oxygen and was once common on primordial Earth . Phosphite is not common in the natural cycle today, so there are questions as to where it came from in the past, when microbes widely depended on it. It's hard to account for global quantities just from lightning, but its an intriguing newly recognized source. Sen. Jon Kyl previously held up an Energy Dept. nomination to get a Senate committee hearing on the bill. In early 2004, ASU geoscience professor Phillip Christensen was in a NASA press conference on the recent Mars Rovers, when he casually commented how much easier collecting rock specimens would be in the locals would just pick them up and mail them to him. The rocks started arriving at ASU even before he got back to campus. Rocks continue to arrive at the rate of 50-100 per month. Each rock is , numbered, cleaned and photographed, then cooked in an oven for 8 hours to drive off moisture before it is run through an infrared spectrometer. They are permanently archived in a special storage space. Dr. Marcia McNutt studied geophysics at Scripps Institution of Oceanography in La Jolla, California and earned her PhD there in Earth Sciences in 1978. She spent 3 years with the USGS in California working on earthquake prediction. She joined the faculty at MIT in 1982 where she was appointed the Griswold Professor of Geophysics and served as Director of the Joint Program in Oceanography & Applied Ocean Science & Engineering, a joint program offered by both MIT & the Woods Hole Oceanography Institution. Marcia has participated in 15 major oceanographic expeditions and served as chief scientist on more than half of those voyages. She has published 90 peer-reviewed scientific articles and also chaired the President's Panel on Ocean Exploration convened by President Clinton to examine the possibility of initiating a major US program in exploring the oceans. She is a fellow for the American Geophysical Union, the Geological Society of America, the American Association for the Advancement of Science and the International Association of Geodesy. She is a member of the National Academy of Sciences, the American Philosophical Society and the American Academy of Arts & Sciences and serves on numerous evaluation and advisory boards for institutions such as the Monterey Bay Aquarium, Stanford University, Harvard University and Science Magazine. The International Monetary Fund predicted economic contraction this year of 1.4% but raised its expectation of growth next year from 1.9% to 2.5%, resulting in a nice boost for copper prices, according to an analysis on Mineweb.com. The Rosemont Copper Project would have lasting positive effects on the economy of the study area. Permanent changes to the regional economy would occur as a result of the increased levels of economic activity associated with the development and operation of the Rosemont mine. 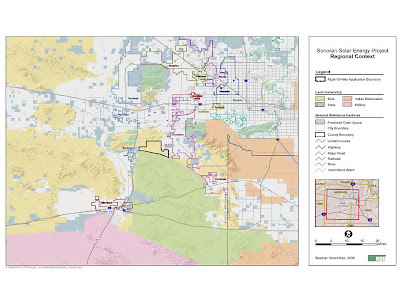 These changes would result in residual economic impacts in the Pima/Santa Cruz Counties area. Even five years after the end of production at the mine, economic activity would be $75 million per year higher and area residents’ income $37 million per year more than if the Rosemont Copper Project had never existed. The study is included in a newly released report by the Arizona Dept. 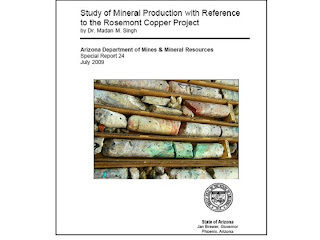 of Mines and Mineral Resources titled, "Study of Mineral Production with Reference to the Rosemont Copper Project." 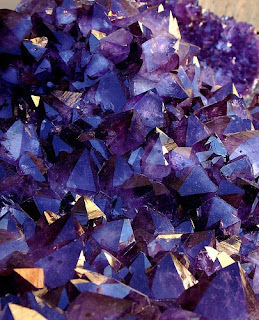 Photo Synthesis, "a rotating showcase of the best science photography on the web," includes Arizona photog B. Jefferson Bolender as one of the regular contributor and her latest post is set of spectacular shots of minerals [right, amethyst. Credit, Photo Synthesis] taken at the last Tucson Gem and Mineral Show. There are links to more photos and more mineral photos are promised. The 58th annual BP Statistical Review of World Energy, released a few weeks ago, documents one of the wildest and most significant energy years on record. In addition to record rise and collapse in oil prices, I was surprised to read that annual oil prices rose for a 7th consecutive year, a first in the 150 year history of the oil industry. For a sixth consecutive year, coal was the fastest-growing fuel – with obvious implications for global CO2 emissions. Jon Spencer, Senior Geologist with AZGS, gave a tour de force presentation at the monthly meeting of the Arizona Geological Society here in Tucson last night, offering a tectonic reconstruction of Southern Arizona through the late Cenozoic, to propose a model for the origin of the regions huge porphyry copper deposits. His talk, "Restoration of tectonic extension in the greater Tucson area and implications for original distribution of porphyry copper deposits," integrated results from decades of geologic mapping and subsurface geophysics to estimate amounts and direction of faulting, primarily extensional, during the Late Cenozoic. 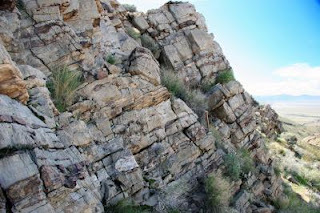 Restoring porphyry copper deposits along the displacements resulted in bunching them into two long ovals [above, right], trending WSW-ENE, generally parallel to Proterozoic structural fabric. Jon suggested there may be a causal relationship. Some of the questions addressed age dates and Eric Seedorf noted that deposits such as Safford and San Manuel, shown by Jon as possibly part of the same tectonic feature, are about 12 million years apart in age. The Arizona Republic editorialized recently that ASU's work on the Lunar Reconnaissance Orbiter "represents a valuable contribution to Arizona's standing in the world and enhances our state's ability to attract talent, investment and economic development in competitive high-tech fields." The editorial went on to note achievement at all 3 state universities, concluding, "These sorts of far-reaching benefits from Arizona's quality research-based universities are so engrained in Arizona's identity that it is easy to take them for granted. But like flying to the moon, the accomplishments of the should inspire excitement that transcends temporary budget problems."